Roger Fisher (born February 14, 1950) is a guitarist primarily known as one of the founding members of the band Heart. His tenure lasted from 1963 (in the band's first incarnation) until 1980. The band Heart started out as the Army in 1963 in Seattle, Washington, formed by bassist Steve Fossen and brothers Roger and Michael Fisher. The group went by the names Army, Hocus Pocus, and White Heart before settling on just Heart in the mid-1970s. Ann Wilson joined the band in 1970 and Nancy in 1974; romances sprang up between the Fisher brothers and Wilson sisters, with Mike dating Ann and Roger dating Nancy. Heart rose to fame following the release of their debut album, Dreamboat Annie, in 1976. Follow-up albums Little Queen, Magazine, and Dog and Butterfly also sold well. Following the release of the Dog and Butterfly album, the Roger Fisher / Nancy Wilson romance came to an end. In February 1980, Fisher was dismissed from the group. In 1990, Roger Fisher formed the band Alias with vocalist Freddy Curci and guitarist Steve DeMarchi, both were previous members of the Canadian rock band Sheriff. The two other musicians were also ex-Heart members Steve Fossen on bass and Mike Derosier on drums. Alias had a few hits, most notably in 1990 with the song “More Than Words Can Say”, which in 2005 resurfaced in a Subway sandwich commercial. Alias toured extensively through 1990. The band also performed twice on The Tonight Show Starring Johnny Carson, once with Johnny Carson and once with Jay Leno. The group disbanded in the early 1990s while touring to promote their album. Fisher continues his musical career. He has recorded two solo albums and has collaborated with many musicians in the Pacific Northwest USA, including session/touring percussionist Matthew Burgess. He was also involved with a group called "Clever Bastards". Fisher moved with his family from Washington State to Prague, Czech Republic, in 2007. As of September 2008, however, he resides in Monroe, Washington. Fisher was inducted into the Rock and Roll Hall of Fame as a member of Heart. 1990 : Alias - Starring Freddy Curci on vocals, Steve DeMarchi and Roger Fisher on guitars, Steve Fossen on bass and Mike Derosier on drums. 2000 : Evolution - Roger Fisher plays guitar, Sitar, Bouzouki, Percussion, Bass Guitar and Lead Vocals. Produced by Roger & Mike Fisher. 2016 : All Told - Listed as Roger Fisher And The Human Tribe. ^ The instrument shown in the photo was created from two single-necked guitars; it is not a factory Gibson doubleneck. 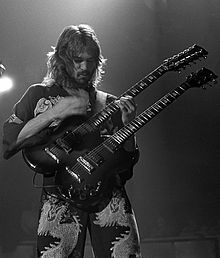 In Guitar Player issue December 1979, it is described by Roger as "a Gibson SG that was modified into a 6- and 12- doubleneck guitar by Ed Myronyk." The guitar was used to record "Love Alive" as well as "Soul Of The Sea". ^ "Roger Fisher and Creating His Custom Guitars". Fisher Bros and the Human Tribe. 2 June 2018. Retrieved 10 July 2018. ^ Saulnier, Jason (15 March 2012). "Roger Fisher Interview". Music Legends. Retrieved 7 May 2013. ^ Gould, Elliot (17 March 2018). "An Interview with Roger Fisher of Heart - Crazy On You". Render Edge Media - Rock Music Series. Retrieved 14 May 2018. ^ Interview on the Dori Monson KIRO 710 radio show, Sept. 5, 2008. "All I Wanna Do Is Make Love to You"
"I Didn't Want to Need You"
"Will You Be There (In the Morning)"
"More Than Words Can Say"